It is said that love always wins, this is mostly true but for many celebrities, it is far from reach. Part of being a celebrity in Ghana is having your personal life under the public microscope all day. Everything you do will attract both criticism and admiration at the same time. This may come in the way of creating real connections in your personal life. You have to find a partner that is willing to handle the consequences that come with your celebrity status. Despite all these hurdles, 2018 has seen some of Ghana’s top celebrities walk down the isle and tie the knot with the loves of their lives. YEN brings you the latest news in Ghana on the 5 top Ghanaian celebrities that tied the knot in 2018. Award winning Ghanaian actor John Dumelo had successfully kept most of the details of his relationship with his long-term girlfriend, Gifty Mawunya for years. This was until this year when he decided it was time to take things to the next level and went on to marry her. In a colorful traditional ceremony on the 12th day of May at Gifty’s parents’ house in Spintex. The event was attended by a number of high-profile individuals such as the former president John Mahama, actor Ramsey Noah and Majid Michel. 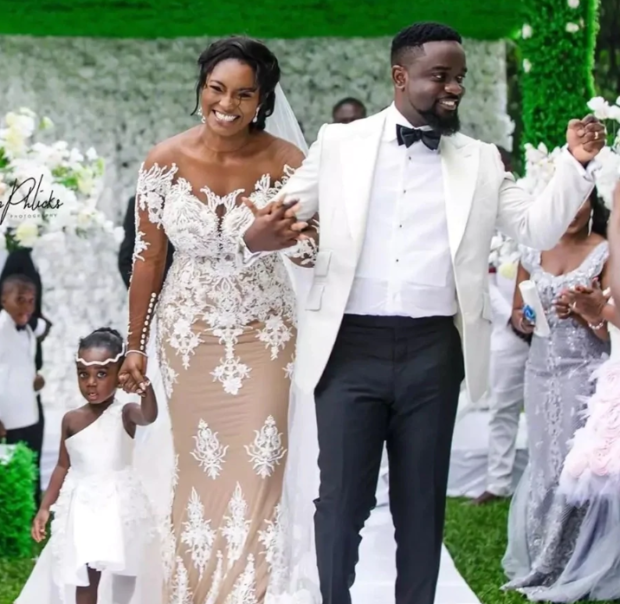 Michael Owusu Addo, also known as Sarkodie tied the knot this year as well with his girlfriend of over a decade, Tracy Ama. Sarkodie and his fiancé had a two-step wedding, first, they had a traditional wedding on the 17th of July at 7 Guava Link Community 18. Later in the same week, the couple finished off their nuptials with a white wedding on Saturday the 21st of July at a colourful event graced by many of his celebrity friends. Sarkodie and Tracy already have a daughter together, two-year-old Adalyn Owusu Addo. After a flurry in the media from two years ago sent rumours flying that Becca had an affair with Bisa Kdei and a lot of controversies that followed, Becca tied the knot on the 18th of August with Dr. Tobi Sanni. A surprising turn of events as no one expected the former Ice Prince manager, Dr. Sanni to be the one waiting at the altar. The elated star took to her Instagram page to post a photo of their happy nuptials. The caption alone shows just how much work had gone into planning the wedding. Sammy Forson’s wedding to his fiancé Pearl Johnson is among the most recent trending news in Ghana. The wedding took place on the 1st day of September in Bolgatanga in the Upper East Region. This is also Pearl’s hometown. The two tied the knot in a colourful traditional ceremony. Sammy took to his social media pages to share pictures of their happy nuptials in the days that followed. Actor and movie director Eddie Nartey tied the knot the most recent of all the celebrities in Ghana making the latest news. He married his long-term girlfriend Vida Danso in a private ceremony held on 22nd September. The attire for the traditional wedding looked royal in white outfits. As is usually the case with many celebrity weddings, the guest list was not short of famous names including Van Vicker, Prince David Osei, Juliet Ibrahim, Pascaline Edwards and more.